I’m so happy I’m awake during the day time! 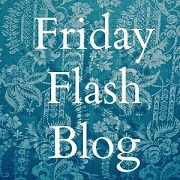 With Fibromyalgia it is really easy to get your days and nights mixed up. I’m actually glad I got a cold since I slept extra and woke up closer to mourning yesterday and now today I woke up at 5:30 am! 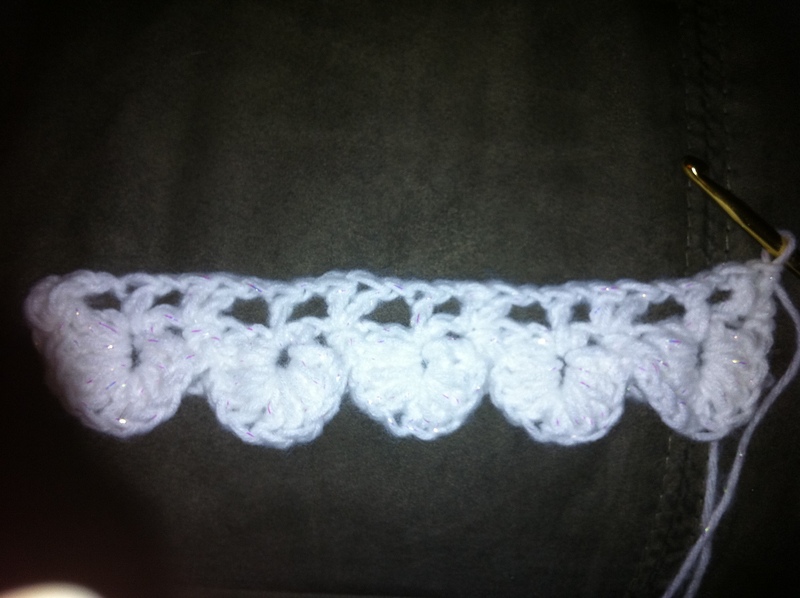 I’ve decided that I’m going to use today to learn to crochet the crocodile stitch and make a pretty scarf. I know it is easier than it looks since I mostly learned it yesterday – I just had the wrong yarn. I’m not using the yarn I wanted to use because the boucle is too fuzzy and makes it impossible to see the stitches. That just doesn’t work so hot for learning something new. I’ll save that for after I’ve learned the stitch better. I’m learning from watching video’s on youtube.com. I’ve watched several (there are a lot of variations) and many of them just don’t show the stitches clear enough. The one I’m using is here but it is really long (half an hour) and has several commercials throughout. This will be a post in progress as I work on learning the stitch and making my scarf. I do have some pain in my hands (I also have osteo-arthritis) so I’ll probably have to take several breaks as I go. I’m using red heart shimmer in snow. This yarn came out last year around Christmas and I’m sure we will be seeing it again soon. It has a pretty iridescent sparkle to it. 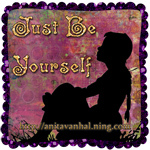 Vanna also has a yarn very similar to this. I haven’t used Vanna’s version but I really like the Red Heart Shimmer because it is thinner (even though they say it is worsted weight it is definitely a thinner yarn). This stitch looks much nicer in a thinner yarn like this. I am using a size H hook which is the recommended size on the package from the yarn, however, this stitch is easier to learn if you start out using a larger hook so you can see each stitch. 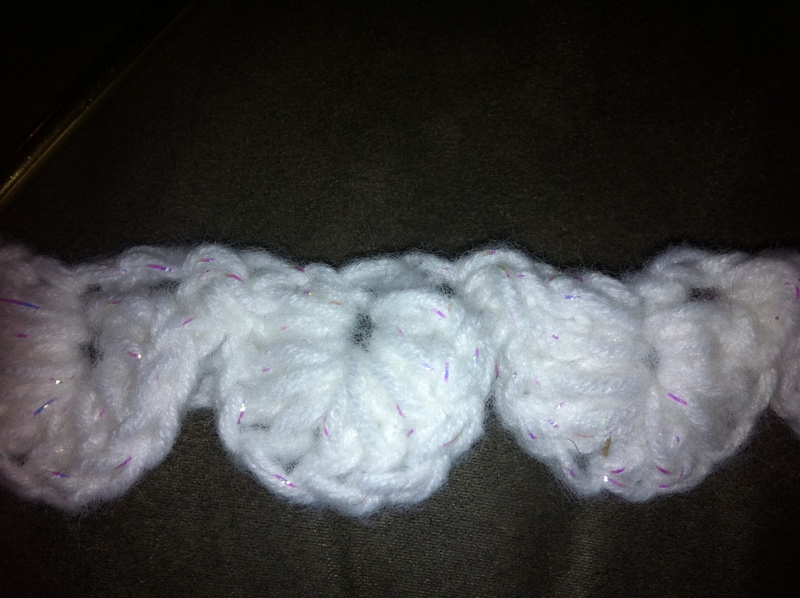 Double crochet in 2nd chain from hook, chain 1. Skip 2 chains, in next chain work 2 double crochet, chain 1, skip 2 chains, in next chain work 1 double crochet, chain 1 – continue until you get to the end of your row. You should end with one double crochet in the last chain. What you end up with looks kinda like a ladder… made up of v stitches (2 double crochet in one chain) alternating with an individual double crochet. Mainly, in the next step you are going to work around the post of the V stitches. 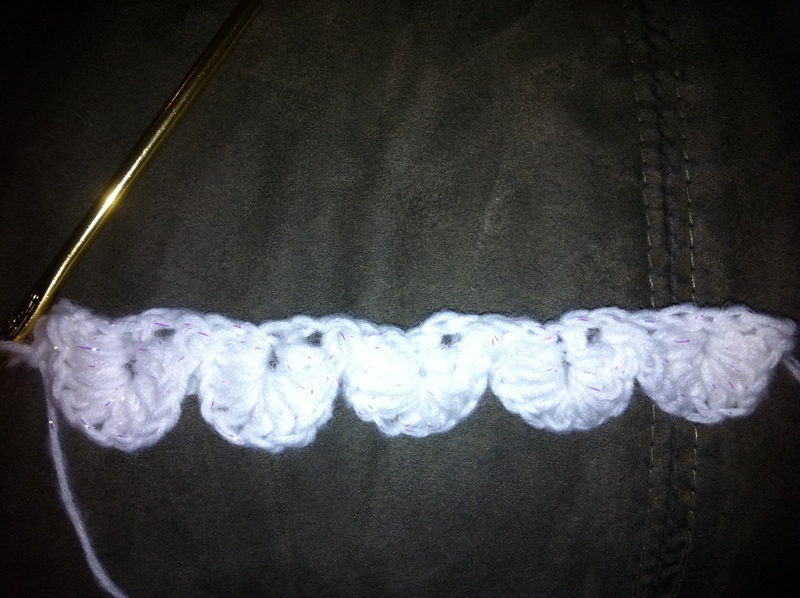 Just think of the double crochet stitch as a bar or a post that you have to work around. Just stick your hook under the stitch and through to the other side – in the space between the two double crochet, wrap the yarn over your hook and pull back through. It helps to fold your work so that the double crochet you are working around is at the top. slip stitch around the post of the individual double crochet then repeat the above step on the next V stitch. Now this is where it gets a little confusing and it’s hard to see what she’s doing. Immediately after turning you need to find the top of the first double crochet – the last one you worked from the previous row. It should be right at the beginning edge of a tongue shape – the stitch you worked a slip stitch around in the previous row. I actually had to undo a little bit to find that last double crochet so I knew where I needed to go. Into the top of that double crochet make two double crochet and then chain 1.
like before it is very hard to figure out where to go here but try to find the top of the individual double crochet from the previous round. It should be right at the edge of the tongue shape. If you can’t figure it out just find a stitch that lines up with the edge of a tongue shape that is closest to your hook. Don’t go into a large space because it will shift. 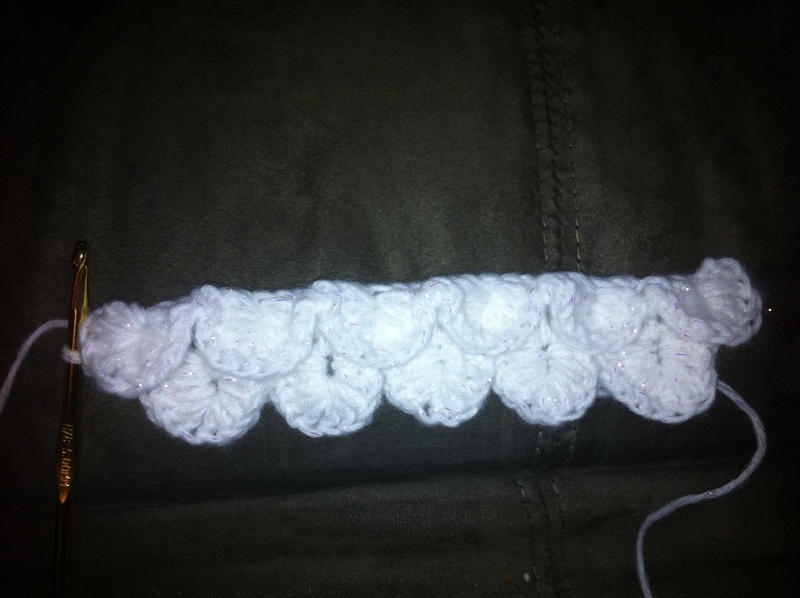 You need to make two double crochet and then chain one. 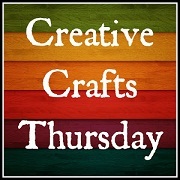 Make one double crochet into the space in the middle of the tongue shape and then chain 1. Continue to the end. 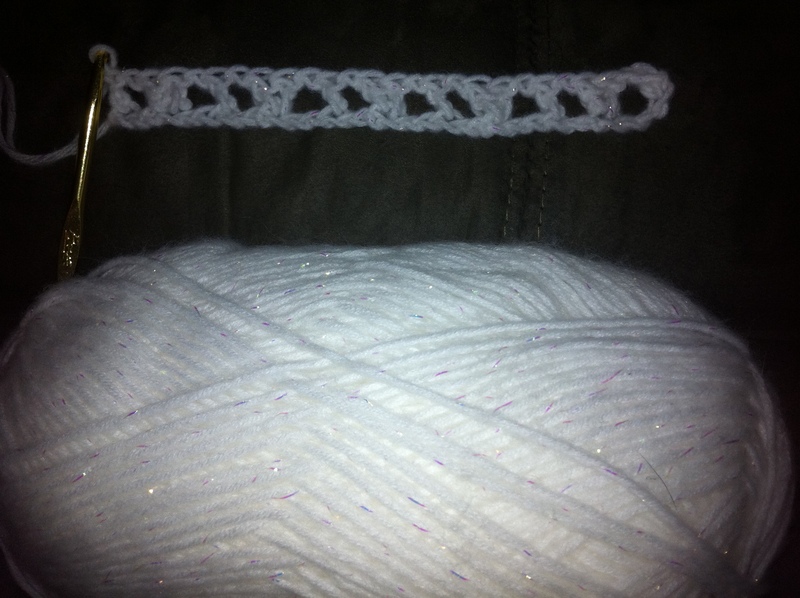 In the chain at the very end (the chain you made before turning to start this row) make two double crochet. Chain 1 and turn. Please refer to the video above by Teresa if you can’t figure this out. Now turn the work sideways and work 5 double crochet around the post of the first double crochet (first one of the set of two), turn the work around so you can work 5 double crochet into the next double crochet. Work a slip stitch around the post of the next individual double crochet. Work 5 double crochet around the next double crochet (first in set of two), turn work and work 5 double crochet around the next double crochet, slip stitch around next individual double crochet. Continue to the end of the row finishing with a tongue shape and then a slip stitch into the chain at the end. This last row of tongues are overlapping the previous row and it looks pretty cool! I’m going to post this now but I’ll add to it as I go. Well done to YOU, Donna! It looks great and I appreciate the step-by-step photos as it makes more sense to me on how it forms the design. Thanks so much. I’m glad you liked the photos. I wish the yarn wasn’t white. The flash washes it out too much and without the flash it was too dark to see clearly. I’ve been up all day today so I’m really happy about that! That gives me more time to be with my family. I’d be happy to help just let me know where you are stuck or are you getting started? What are you making? I’ve only made a scarf so it would have to be something rectangular. Oh yes, and thank you for visiting me today!